Most homes in the United States of America are heated with either furnaces or boilers. Excessive air noises, water dripping at relief valve, water dripping at piping connections, smell of heating oil or natural gas, noisy or smoky burner operation are some of the symptoms of boiler repair. Be it boilers, furnaces or any other types of home heating systems, we offer you a very good and satisfactory plumbing services in Essex County, NJ. If you are looking for a good and trusted plumbing company in NJ, then you have rightly found us here. Be it a minor or major issue, we will help you in getting your plumbing worries fixed once and for all. All your plumbing and heating requirements can be addressed through our helpline number. We provide you a free estimate and arrange a prompt call back. Our plumbing company is located in Essex County, NJ. Online bookings for the plumbing services are also available. We are always there for you, twenty hours a day and three hundred and sixty five days a year. We offer customized packages for each of our customers which are entirely designed by our skilled technicians to perfectly match your specific set of requirements. We guarantee you the best price in the market for an unmatched quality of services. And we are committed to timely resolution every time. Our company, located at New Jersey, is experienced in all facets of plumbing repair. Our extensive plumbing services include Boiler system repair services, Water Heating system repair services, Filtrating system services, Bathroom fittings services, Fixing faucets, etc. We have certified service technicians and properly licensed water heating system installation technicians who would provide you a quality work that you won’t find with the other companies. Our company has access to a huge inventory of parts, including parts for older units and smaller manufacturers and this makes our emergency service easier. Our boiler service and maintenance technicians keep your boiler running smoothly, efficiently and safely throughout the year. They also help you in Identifying and stopping potential problems long before they occur, saving yourself time, money and hot and cold weather problems. An annual heating system service will increase the system efficiency and reduce monthly energy costs. It will also ensure a safe operation and prolong the equipment’s life. We also offer you preventive maintenance services for all types of plumbing systems. With physical locations in Essex County, we are able to provide hot water boiler repair nj and other services in and around NJ. Contact us for guidance on the best ways to save energy, season after season. 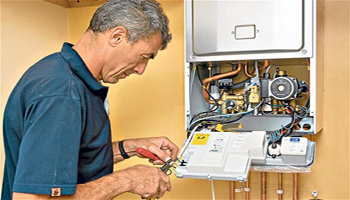 Our expertise plumbers could also help you to save money on your heating bill by keeping your system in to shape.